What is dysgraphia? It’s a learning disability that results in difficulty with the process of writing. Learn the symptoms, accommodations, tech and more. See that’s the thing, dysgraphia is not a new phenomenon or struggle. There have always been those that struggle with handwriting and written work. One of the most joked about examples is doctors who often struggle with dysgraphia (the famous messy doctor handwriting). See it has nothing to do with intelligence or ability or potential, yet in a school system that is heavily focused on handwriting to prove knowledge, this condition can become extremely challenging in a classroom or learning environment for students with dysgraphia. 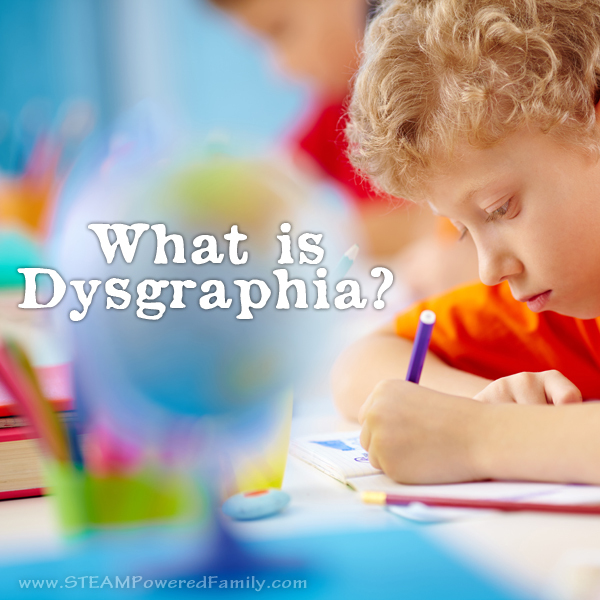 So what is dysgraphia exactly? It’s a learning disability that results in difficulty with the process of handwriting and expressing oneself in written form. When I first started looking for resources to help my son, I found there was very little information. 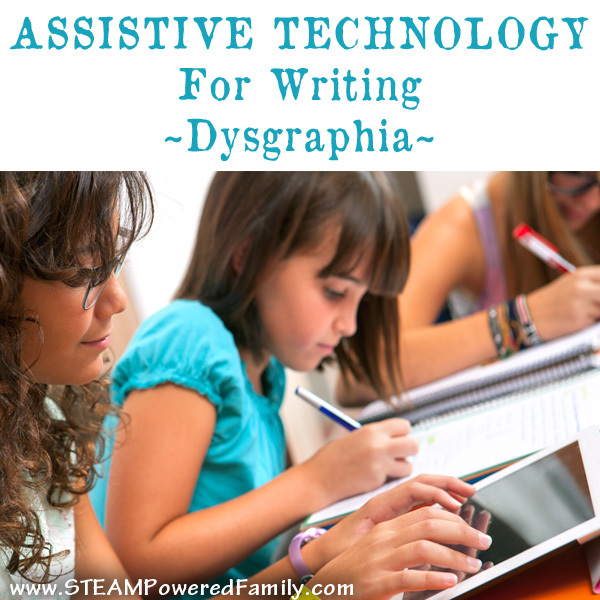 We’ve been working to address my son’s dysgraphia for over three years now. In this series I’m going to pull all my resources and knowledge together so I can hopefully help others either struggling, or those parenting or teaching children struggling with dysgraphia. I’m not a professional, just a mom trying to do the best by my son, but in this series I will link to some professional resources that I’ve found helpful over the years. I hope you find it helpful too. So when should you start to worry about possible dysgraphia or that your child is struggling with writing more than would typically be expected? Obviously all kids start out with messy printing when they make their first clumsy attempts at holding a crayon. 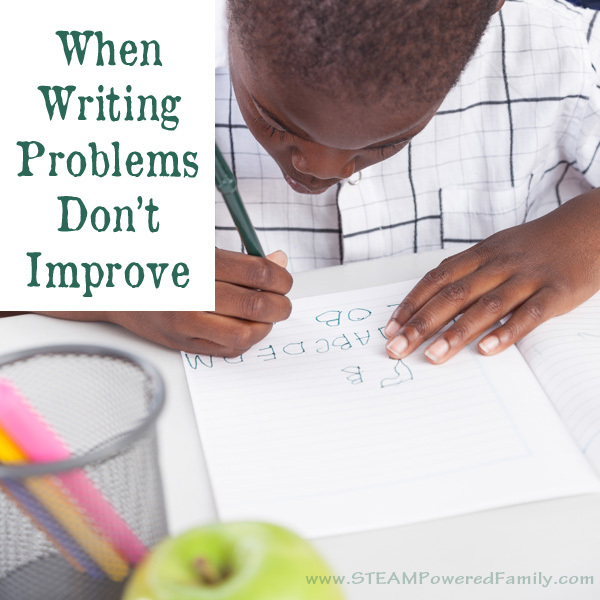 Writing is a very complicated skill that takes years to develop, but at some point children with dysgraphia will start falling behind their peers and presenting with various struggles, then it’s time to take a closer look. If it seems like your child is struggling with handwriting and their printing skills are not developing, then it’s time to look for some specific symptoms. Having a list of a documented list of challenges and symptoms will help you advocate for our child when you seek professional help from an Occupational Therapist. But the symptoms don’t necessarily paint a complete picture. Like many conditions, sometimes the behaviours a child is presenting do not seem connected until you take a moment to see the big picture and compare it with examples from other people. The impact of dysgraphia can be far reaching and complex. Sometimes behaviours can mask the root of the issue. This condition goes beyond struggles in written work or putting thoughts on paper. 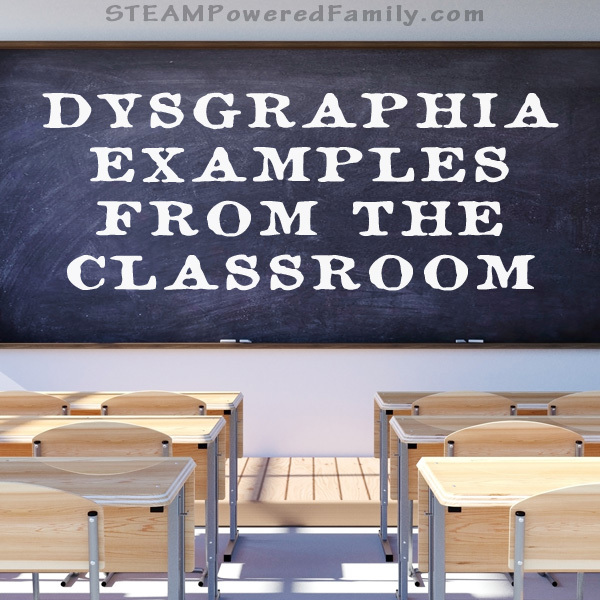 Perhaps you are wondering how common dysgraphia is in the general population. Turns out it is very common. According to Dr. Fernette and Dr. Brock Eide in their book The Mislabeled Child, as many as one in five children (it’s more common in boys) have difficulty with writing skills, letter formation and fine motor skills. 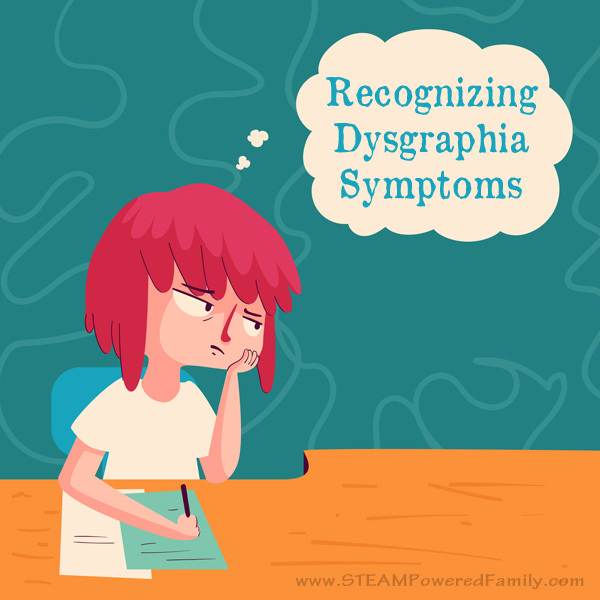 When you look at the examples and signs beyond the symptoms, it seems dysgraphia may be a common thread in the struggle many boys have in the school environment. In our experience it is extremely challenging to get a formal diagnosis. There is little consistency and no single test that gives a definitive diagnosis. Instead diagnosis relies on a battery of tests and observations over time. In our experience the school was willing to begin accommodations simply based on teacher observations. Testing can be very expensive and difficult to access, especially for the schools who often have very limited professional resources. If you are unable to access support through a school and wish to pursue a diagnosis look for occupational therapists, psychologists or doctors who specialize in the diagnosis of learning disabilities. 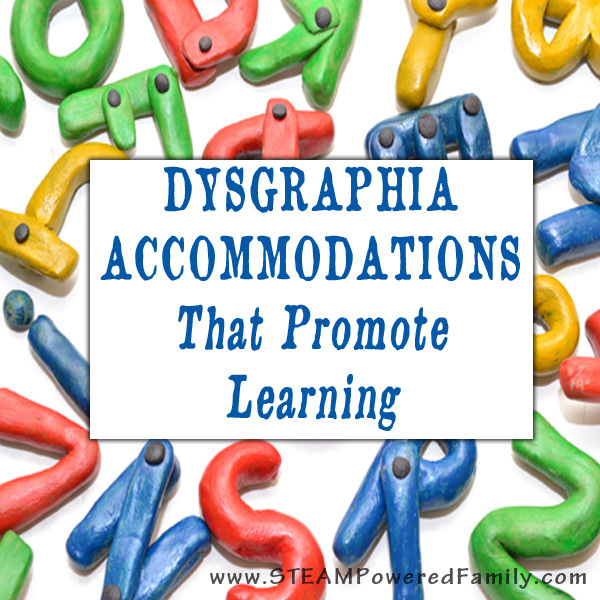 Once it’s determined your child does have dysgraphia, or even if you are still in the difficult process of trying to get a confirmed diagnosis, there are things you can do to help promote their well-being and learning in the classroom or homeschool. Many of these accommodations are not hard to implement and will make a world of difference to the child. Dysgraphia is not something that can be cured, instead we need to change expectations and the environment. As an adult we have a lot of flexibility in how we present our ideas. Accommodations are readily accessible to adults, we need to do the same for children. Beyond accommodations there are tools, specifically writing tools, that can help people of all ages that struggle. We live in a fabulous age where there is so much technology and so many new tools that can be used to remove the pressure to handwrite all the time. This can allow those struggling with dysgraphia to focus on conveying their ideas, processing information, and learning. It’s important to understand that dysgraphia is not something a person outgrows. Instead it is a permanent condition, a learning disability, that the person must learn to work around. Just like dyslexia never goes away, dysgraphia will always be there. But by equipping students with the tools to navigate the school system successfully, we can set them up for an adult life where they can achieve success. Need more resources? Here are some of my favourite resources. Finger and hand exercises that may help those with dysgraphia.